This is a fabulous handmade bag for your knitting, crochet, craft project or just general use. It easily holds 2-4 skeins of yarn with room to spare. This will stand up on it's own if filled or the top can be folded down if desired. 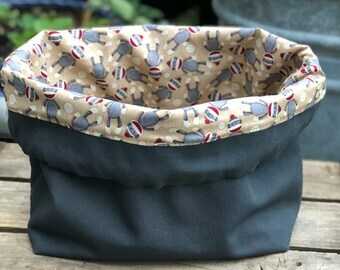 There is a divided pocket that runs along one side that will hold knitting needles, crochet hooks, pens, extra and the bigger pockets are the perfect size for a folded pattern or small notebook, cell phone, etc. 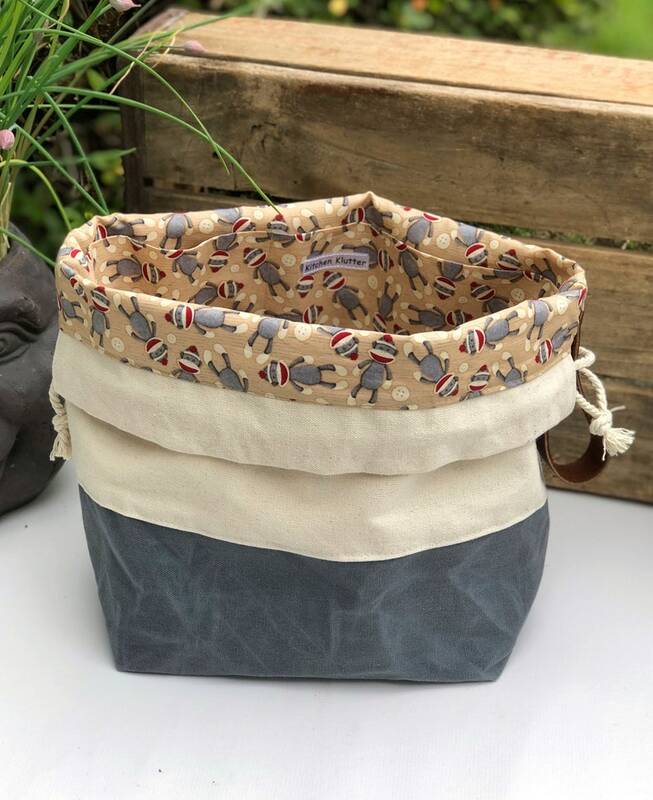 It is made from heavy, durable Waxed Canvas lower, unbleached natural duck canvas upper, 100% cotton fabric interior, a leather finger loop that is hand stamped with my shop initials and a cotton drawstring cord. This is a good size bag, It measures approximately 15" wide x 12" tall and is 9" x 6" on the bottom. This does not have pockets in it. The waxed canvas is naturally water and stain resistant but the other fabric has not been treated in any way but you could waterproof it if desired, I strongly suggest using a product like Scotch Guard to help keep it clean. Waxed canvas is not washable but the canvas and flannel can be spot cleaned as needed. International buyers may be subject to additional duty and taxes.